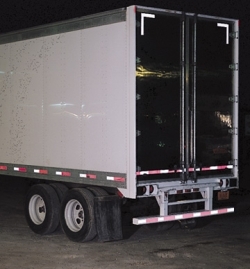 can help you increase trailer visibility at night and in poor weather -- and decrease the chance of accidents. Easy-to-apply tape sticks to a variety of surfaces including fiberglass, aluminum, and painted steel. It resists common solvents like gasoline, turpentine, toluene, and kerosene. For product codes WW-663-R, WW-663-R-A, WW-663-R-M and WW-663-R-S each roll is 2" W x 150' L, with alternating 11" bands of red and 7" bands of white. For product codes WW-683-R-M and WW-683-R-S each roll is 2" W x 150' L, all white. For product codes WW-693-R-M and WW-693-R-S each roll is 2" W x 150' L, with alternating 6" bands of red and white. For product code WW-687-R-M each roll is 2" W x 150' L, kiss-cut into 12" strips, with alternating 6" bands of red and white. Avery Dennison® (repositionable pressure sensitive).